Good morning! I have a non-craft related post for you today. I mentioned a little while ago that I've gotten into an organization kick so I thought I would throw in the odd organization post to share with you some of the things that I've done. You can see that I had some baskets in there in attempt to organize but nothing was labelled and there was no rhyme or reason to it. Plus it isn't very big and housed everything from sheets, towels to table clothes, minor appliances, light bulbs and cleaning supplies. 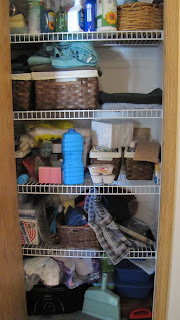 My goal was to have a place for everything and make it obvious where everything goes - not just for me but for everyone. So I emptied everything, cleaned it out and sorted it all into piles (cleaning, toothcare, bed sheets - separated by size, etc.). I reused the baskets that were already in there and then grabbed some plastic bins that weren't being used from our storage room and added a label to everything. That's where my SU things came into play. I made the labels in word and just printed them on white cardstock. Depending on their size, I either punched them out using the oval punch or used the Apothecary Accents framelits to cut them out. Now everything has a place and everyone in the house can see where to find what they are looking for and where to put it back! I'm happy to say that two weeks later, it still looks like this! 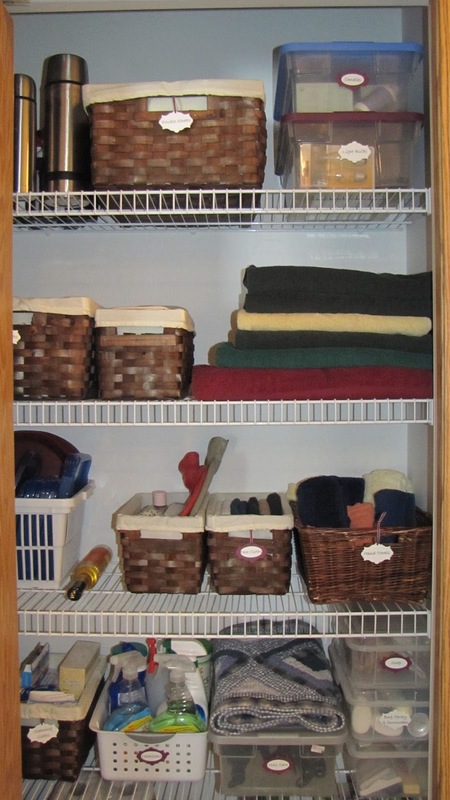 Do you have any linen closet organization tips?